A few weeks ago I realized that my diet soda consumption had gotten out of hand. I used to allow myself one can of soda per day, and after awhile I rationalized that two per day wasn’t all that bad either. Eventually I found myself absentmindedly cracking open a third soda at dinnertime, and I knew then that it needed to stop. I’d been feeling sluggish and sleeping poorly, and I knew the excess caffeine and funky chemicals probably had a lot to do with it. The worst part was that I didn’t really even like the soda anymore; I just felt like I needed it. 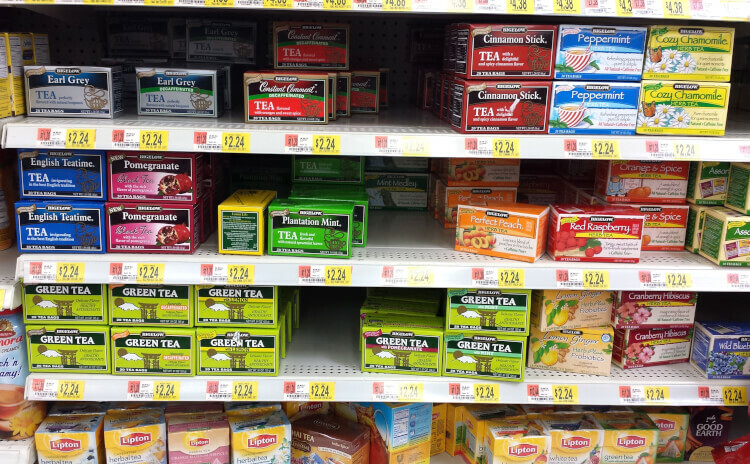 I went to Walmart and stocked up on some of my favorite Bigelow Tea to help me kick the soda habit. I drink plenty of water throughout the day, but I knew that when the craving for something flavored kicked in I was going to need some backup. I chose a mix of caffeinated and decaf teas – Constant Comment, English Teatime, Pomegranate Black Tea and Assorted Herb Teas. I’m not giving up caffeine 100%, but I prefer to limit it to one cup in the morning and switch to decaf for the rest of the day (my sleep patterns are already saying “thank you!”). So far the switch has been really easy! I thought it would be much more difficult, but I’m finding so much enjoyment in my tea time, and the tea just makes me feel so much better! Recent studies in leading medical journals have called tea a potential heart tonic, cancer blocker, fat buster, immune stimulant, arthritis soother, virus fighter and cholesterol detoxifier – it’s no wonder I feel better already! A typical day for me goes something like this: After I’ve dropped my big boys off at school, I like to start my morning with a cup of English Teatime tea on the back patio. 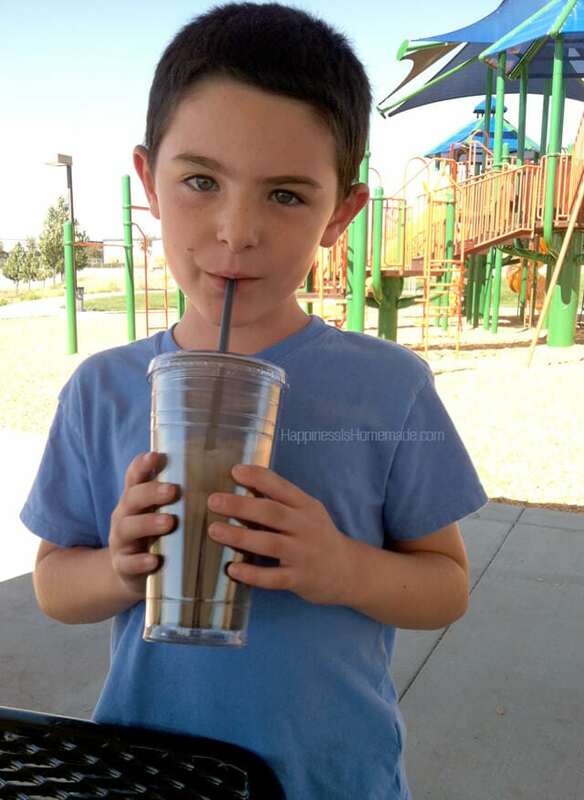 My little guy loves to play outside, so I like to get our outdoor play time in before it gets too hot (it’s still in the high 90’s around here – yuck!). The afternoons might still feel like summer, but the mornings are definitely feeling fall-like, and I love it! After we play outside for awhile it’s time for us to get creative! 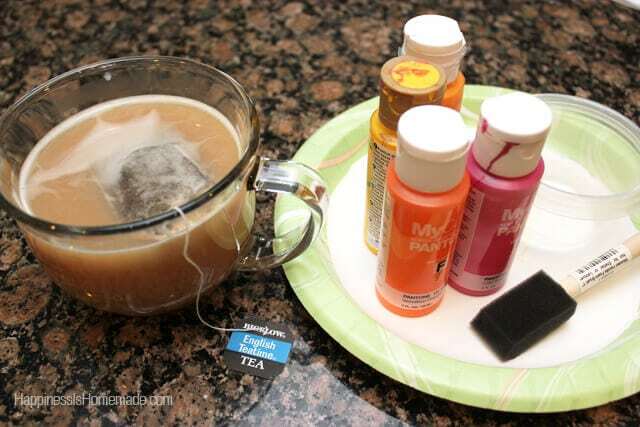 I might make another cup of tea (with a splash of milk this time – yum!) and start on one of my many projects while the little guy plays with playdough, draws or works on a puzzle. 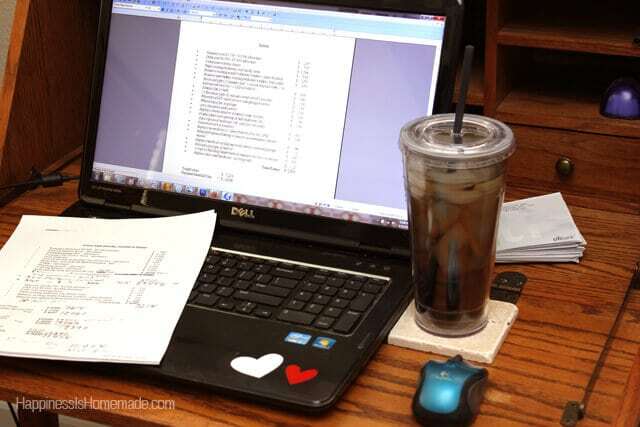 Hot tea has always been one of my favorite beverages, so it’s easy to sip away and not even notice that I haven’t opened up my usual can of soda yet. 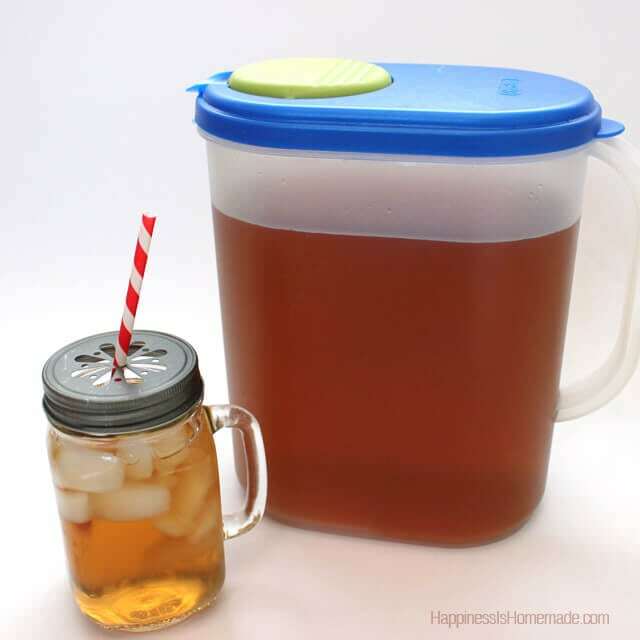 Like I said, it’s still HOT here in the afternoons, so I quickly brewed up a batch of unsweetened iced decaf Constant Comment tea for lunchtime. 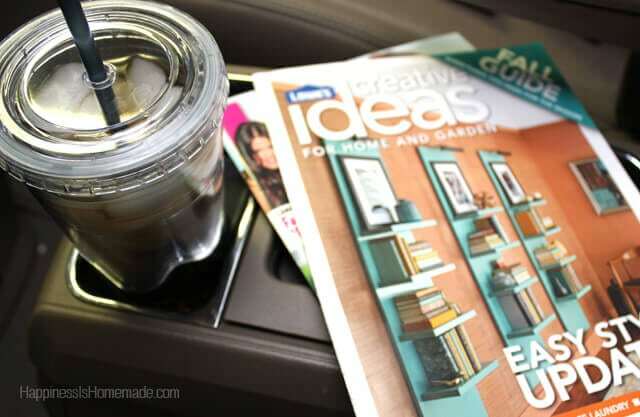 I never really realized that I constantly have a beverage at-hand all day long, so it’s refreshing to know that my new choices are full of antioxidants and immune boosting properties. After lunch it’s quiet time for the little guy and work time for me. I put on a video for Simon (his current favorites are the Your Baby Can Read series, 20 Dogs and 20 Trucks) if he’s not in the mood to nap (which is most days right now! ), and I sit down to catch up on emails and accounting work. Didn’t you know that I have another job too? I’m the business manager for my dad’s general contracting company, and juggling two work-at-home jobs and running a household can often feel overwhelming. I’ve noticed that drinking tea instead of diet soda has really helped me focus better, and since I’m drinking decaf during the day, I don’t experience that caffeine crash that used to have me racing to open another can of soda. I can park next door at the park and walk along the trail over to the school to pick up my boys. I actually love this option because I can arrive five minutes before dismissal time and still snag a good parking spot at the park (luckily they have WAY more parking available than the school does! )…but, of course, it only works when you’re not in a hurry! Naturally the kiddos want to play at the park for awhile when we walk through it! 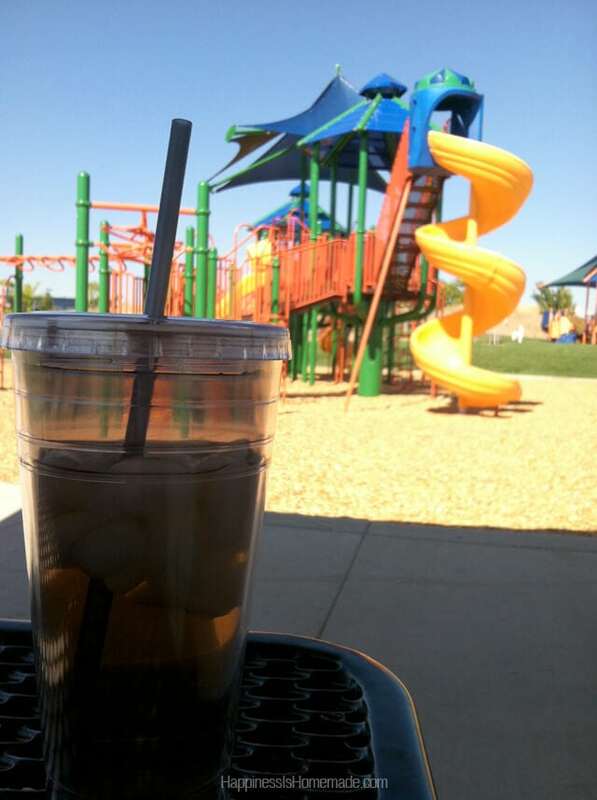 Good thing I have a full tumbler of iced tea to keep me cool while I watch them play! 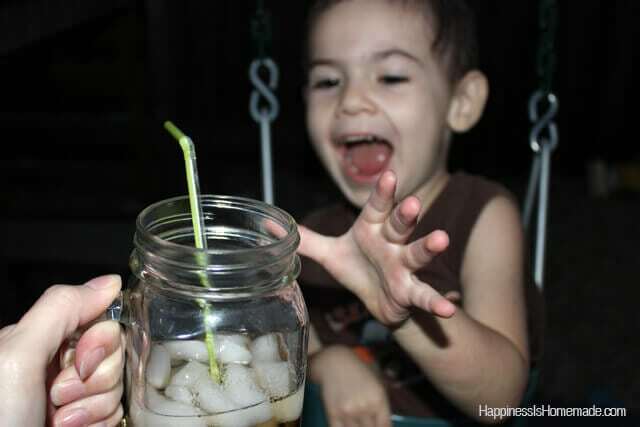 The kids love that I am drinking tea instead of soda because it means that they can take a few sips to cool off too. I don’t allow them to drink very much tea yet since they’re still so young, but I wouldn’t let them have any diet soda previously, so they think that my switch to tea is pretty awesome! New studies have proven that tea is even more beneficial for rehydration than water – tea replaces the water that was lost as well as delivering vital antioxidants and health benefits not found in water. Sounds like a win-win situation to me! After homework and dinnertime is done, we wind down our day with some front porch sittin’ as the kids play outside with their friends, ride bikes, play games and have fun. I added a teaspoon of sugar to my tea to sweeten things up a bit. 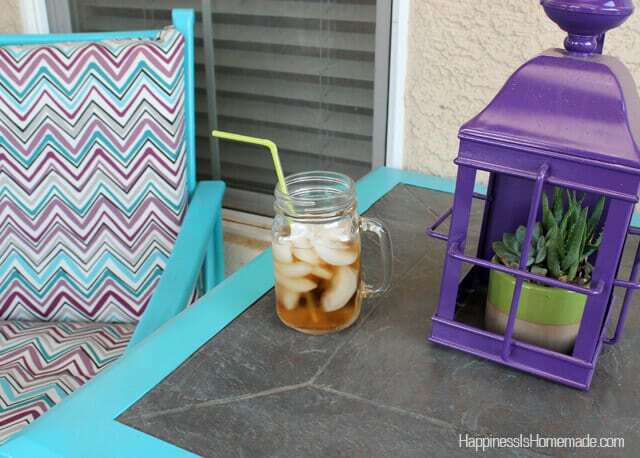 There’s just something so perfectly fitting about sipping a mason jar of sweet tea and chatting on the front porch! The backyard is cool again in the evening, so we cap off the day with a long turn on the swings for Simon and some bouncing on the trampoline before bath time. Even this little guy wants to get his hands on my tea! It looks like the whole family is supportive of my decision to kick chemicals and artificial sweeteners to the curb and replace it with a much healthier and beneficial beverage! 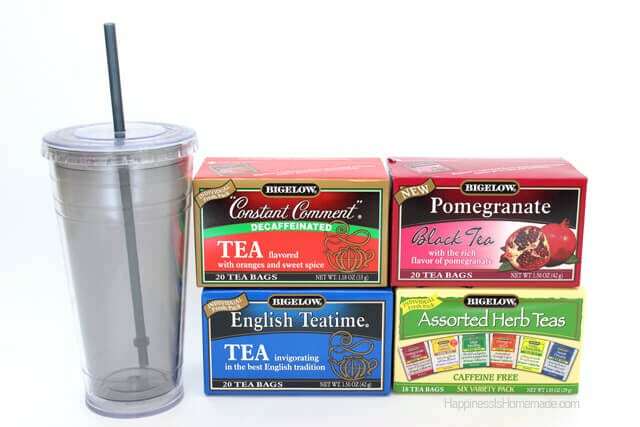 If you’re also considering breaking the soda habit, I highly encourage you to visit the Bigelow Tea website and the Bigelow Tea blog to discover all the health benefits of tea and read about everything that they have to offer! Good for you for kicking the diet soda habit. Soda is SO addictive. And you’re right about getting health benefits from your new beverage. We love tea, too. this sounds like such a good idea. I drink a severe amount of dietcoke in a day…. I’m not a big tea fan, I do drink some raspberry and green tea….so if I were to start ..what kind of flavor would you recommend? 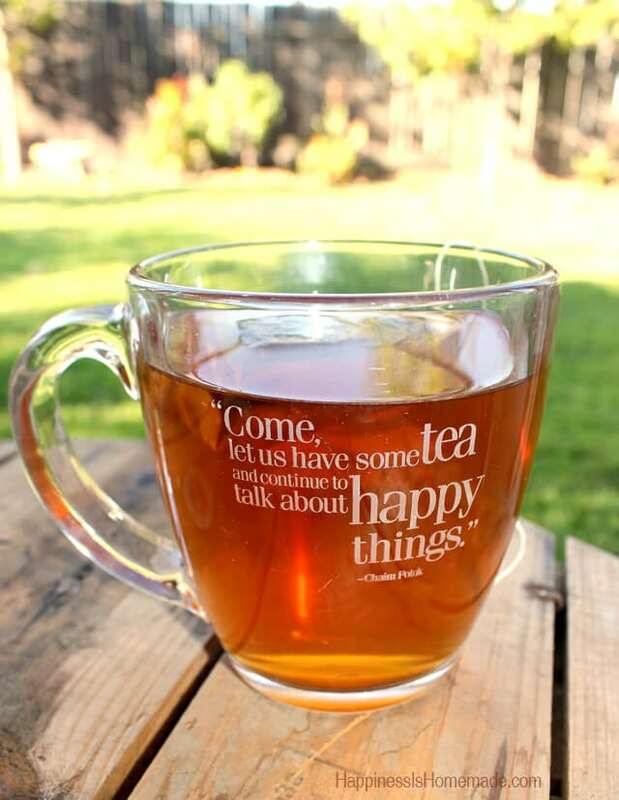 I like your “come let’s have some tea” mug. Where did you get it? Constant Comment is my favorite, but I never thought about having it iced. Good idea! #client Great job on kicking your soda habit. I’ve been doing better with it, but really need to replace more of my soda with tea like you are. Really fun hearing about your tea filled day!